Judging by the Cover – 10/17 new releases – AiPT! Forrest and Eric share their favorite covers from the week’s new comic book releases. Another Thor issue, another amazing Esad Ribic cover. I love the way this one channels this feeling of anticipation as if we’re seeing the split second before Thor sends his ever trusty hammer hurling into a seriously impressive lineup of foes and darkness and all Hell breaks loose. This is one of those covers that could so easily get lost in everything that’s going on but instead strikes just the right balance. I think the take on Klimt’s The Kiss is very clever, and the cover caught my eye for that alone initially, but there are also a lot of other great things going on here. I like the subtle gradient that takes us from rich yellows and golds down to roses and reds, the stark black in the middle, the jealously in the eyes of the beasts looking up — it all works to great effect. While The New World’s story lost me, the art hasn’t. The smart, complete cohesiveness between color and form on display in this cover (as well as within all the issues) is a good example as to why. I love the fluidity of the obviously marble figures, the break between the light and the black, and the way their struggle straddles the line between the two. It’s a cool, subtly effective offering that indicates a lot of forethought and detail upon a closer look. I love detailed art of insects, and this one sure is beautiful. From its spindly legs to its bright orange wings to the furry texture of its upper body, this creature makes a fantastic focal point. 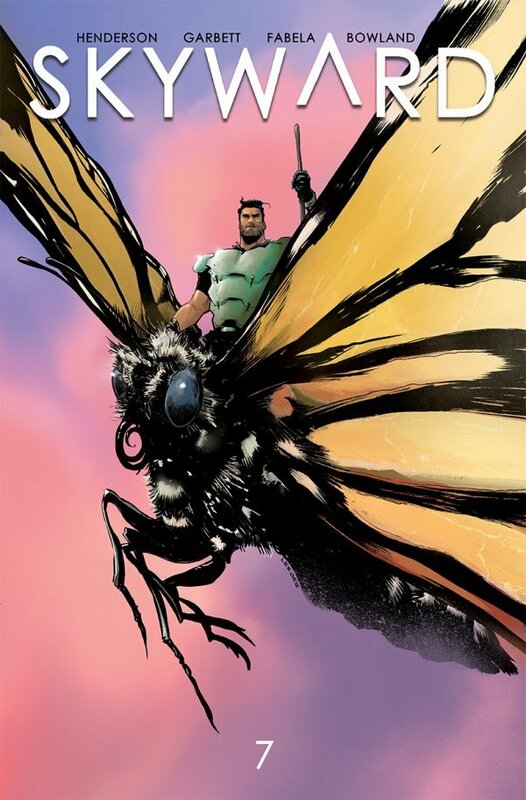 It’s even more awesome when you notice the man riding it–just how big is this bug?! The pinks and purples in the background are lovely as well. This cover is a cool mix of lovely and imposing. I dig the composition of this cover. All the lines twist and turn to lead the reader’s eye from one Justice Leaguer to the next, and this is a quirky group. There’s also a sense of fun to the artwork, from the skull impaled on a spike in the bottom right corner to whatever the hell is reaching up out of Zatanna’s hat. The limited color palette also works very well; there’s something uniquely enchanting about these shades of lime green, and they pop well against the black background. There’s definitely a sense of danger and magic in the air here.